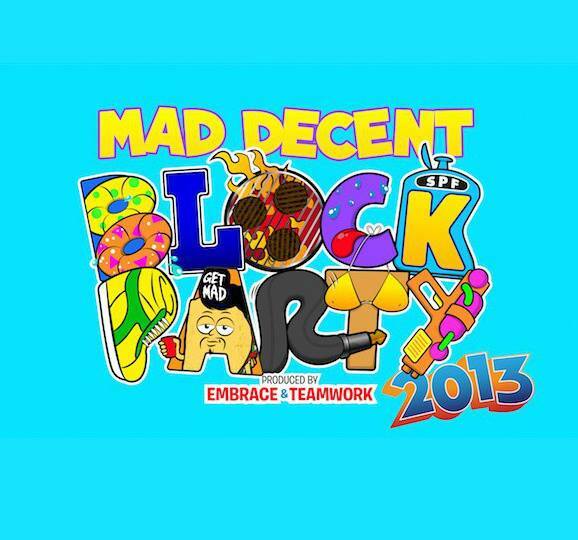 This year marked a transition for Mad Decent and their commercial success. The recent success of Mad Decent has led to a rise of fan base. With a growing fan base and radio play, Mad Decent's Annual Block parties have become a full on tour and major productions showcase. This has led to the full capacity event to begin charging. A step that in a direction i feel deviates from the original purpose of the block parties. How ever you feel on the matter, it is without a doubt that production has increased. This year in Los Angeles the lineup had many artists that are in heavy rotation in southern California currently. All the sets were amazing, but the most noteworthy performances were Matt & Kim, Riff Raff, and Clockwork. As Riff Raff hopped on stage, he was rocking his new Husky puppy. It was an interesting performance with a suprise performance by Lil Debbie (Kreayshawn) and performing "Bake a Cake," which took time from Riff Raff's set. Of course since the schedule was strict, they eventually cut off Riff Raff and he left the stage in an uproar. I will say that the end made Riff Raff that more respected and loved. Receiving a full on crowd chant at his abrupt end. Clockwork (aka R.L. Grime) as always gave a great performance and rocked the crowd. And the best performance goes to: Matt & Kim for their Hip Hop covers, Original classics, and their amazing performance that separated themselves from every act on the bill.